What kinda name is this? Is 'Herald' a human creature? If so, what's the point of the title? Hmmm…is 'herald' something else (noun, verb etc)? Phew, can't make sense, and with a website based in Italian language the only path to follow is music itself and only. Not that bad, let's add. In the end of the day, isn't it for music we (they) keep on doing what we (they) do here (there)? Ahhh!!!! Here we are. 'Transmitted' by the My Graveyard Productions label's website as is: The name itself calls to mind the aim they \[BLOODY HERALD] have adopted: in ancient times the herald was the speaker for the king who went into squares of town screaming the king's word. Got it? This 5-years-old Italian band possesses a really smart/sophisticated name! There only creation-to-date was their 2005 same-tiled demo plus some spare gigs in their homeland. 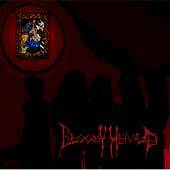 Now, one year later, Like A Bloody Herald Remains comes on screaming the band's word, for which I will easily congratulate everyone capable of drawing a unique conclusion regarding what kinda music BLOODY HERALD make fun with. You can't judge the year of the recordings; that's a first thing to notice. There is influence from Epic Metal (the mid-80's MANOWAR way), there's also a certain amount of New Wave Of British heavy Metal references, the theatrical element is obvious in specific song parts throughout the whole album, there's also some 'dark wave' atmosphere here and there while - last but not least - speed/extreme Metal 'takes' make their appearance at times. Meaning: either the band has not yet 'revealed' its purest self - the search goes on - or the band members have completely varied influences while sculpturing their own tunes. The playing is average. The vocals; plus one. The 'thinking': excellent. Sum it up and you have a more-than-average but less-than-exciting album by a quartet that has the fonts to climb up in the Euro Metal scene, but only if BLOODY HERALD decide which path to choose or start mixing their wants more neatly. The herald has spoken.